anx·ious [ángksh?ss] adjective 1. feeling nervous: worried or afraid, especially about something that is going to happen or might happen 2. ?eager: wanting to do something very much, or in a tense or uneasy way 3. producing anxiety: producing feelings of nervousness or agitation a few anxious moments [Early 17th century. 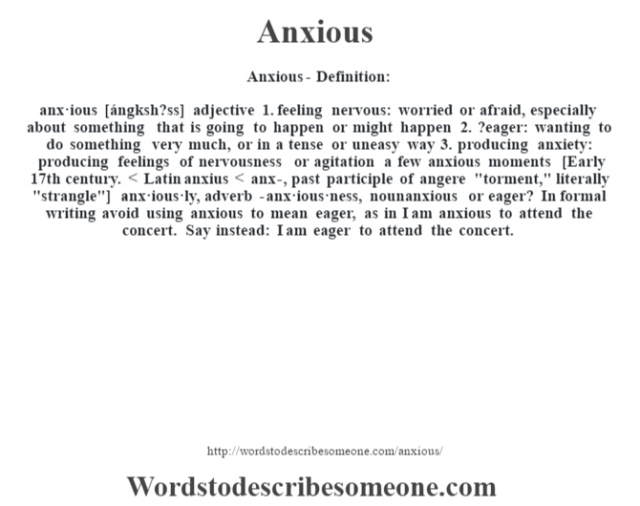 < Latin anxius < anx-, past participle of angere "torment," literally "strangle"] -anx·ious·ly, adverb -anx·ious·ness, nounanxious or eager? In formal writing avoid using anxious to mean eager, as in I am anxious to attend the concert. Say instead: I am eager to attend the concert.